If you really think about it, Proverbs was the first twitter. Short witty sentences combined with meaning and hope, twitter can indeed change people’s view of the Gospel and your church. 1- With ever-present social media now, you can better reach Generation X, Millennials, and Generation Z (typically those born between mid 1990’s and mid 2000’s). These three very large groups live on social media. And live on it daily. It is so commonly used that last year two of my high school students were required to use twitter in a class for certain projects. What better way to communicate with them then on a platform they are most comfortable with? 2- With the limit of only 140 character, using twitter forces you to think ahead and use fewer words. How can you communicate complex ideas with fewer words and still get the same message across. It is not as easy as you think, but it does get easier with practice. I’m convinced this can also help you in your sermon prep since many pastors often struggle with simplifying their message. Bill Hybels from Willow Creek Community Church has said that when associate pastors are given the opportunity to teach, he calls them into his office a week before their scheduled date and asks the pastor to give a 30 second overview of their message. If they cannot clearly and easily communicate their basic premise in 30 seconds, he tells them to go back and prep their sermon more. They’re not ready! 3- Twitter can be used for quick and constant organizational notes to the congregation. Giving short but frequent updates on events, projects, meetings, or a sermon series can help keep church members knowing what is going on. 4- Vision leaks. No matter how often you share the vision of the church, it still leaks out of people’s minds. You have to constantly fill up that bucket and constantly remind people. Twitter is a great way to continually do that between Sundays. Share a quick verse or update on how the vision is affecting people and the church. Twitter can help keep that vision front and center. 5- Quick and constant encouragement. Is your church congregation going through a tough time or struggling with difficult changes? Use twitter to send encouraging notes to the congregation, short prayers, and supportive Bible verses that are appropriate. 6- Build anticipation for upcoming sermons or events or changes. Use twitter to ask questions of the congregation and get them thinking of the sermon topics that are coming up. 7- Use twitter to remind people you are a normal person. Tweet personal things, family things, funny things, interesting things, sad things. Remind them you are a real person, faulty, personable, fun. But don’t tweet constant negative issues or other personal issues that should not be posted on social media. Remember, once it is online, it is always online. Using twitter and other social media can truly help you better communicate to your church and those you target and hope to reach for Christ. Technology and social media has definitely changed the world. But it doesn’t have to be scary. Learn it, embrace it, and use it for God’s Glory. Ask yourself this question, “If Jesus walked on the earth today, would he shy away from using this tool to speak to his flocks?” We think not. The quick rise of social media over the last decade is a reminder that that our methods must continually change to meet the changing needs of our world. But this doesn’t mean the message changes…only the method! 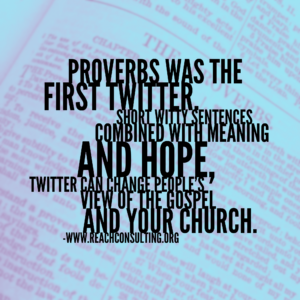 At Reach Consulting, we’re working hard to better use twitter and social media to reach more churches with our message. Does your pastor or church use twitter? How has it affected your ministry?